With Christmas just around the corner, we wanted to share some money tips to help you through the silly season. There’s still time to bag some extra cash to boost your festive finances. Spend a few hours clearing out anything you no longer need around the house, like clothes, books, jewellery, furniture, music, or sporting equipment. You could sell these items online, hold a garage sale, or find a local buy-swap-sell. Presents – Make a list of who you’re buying for, what you want to get them, and how much money you’re prepared to spend on each person. Entertainment supplies – List the food and drinks you’ll need, and how much you can spend. Buy in advance where possible to take advantage of specials, especially if items can be frozen or have a long shelf life. Travel plans – Whether you’re flying or driving, there are ways to save on holiday travel costs. List all your costs like flights, accommodation, travel insurance, airport transfers and petrol. Shop around for deals as early as you can, to avoid paying a premium for last-minute bookings or peak season increases. If you’re going on a driving holiday, work out which day is cheapest to fill up on petrol, and do it the week before Christmas. Keeping track of your festive spending is the best way to avoid going over your budget this Christmas. Use ASIC’s MoneySmart’s TrackMySPEND app to nominate a spending limit for different types of Christmas expenses and track your progress while you shop. If you don’t have the cash to pay for your Christmas goodies up-front, you might be tempted to use your credit card, or use a buy now, pay later service. Although these are convenient ways to get the things you need now, that convenience can cost you dearly if you find yourself still saddled with Christmas debt well into 2019. Before you sign up to a buy now, pay later service, make sure you understand what the terms and conditions are, how much your repayments will be, and when they are due. Most people throw away their Christmas cards once the festivities are over, which is just like throwing money in the bin. write a letter to your loved ones instead of sending a card. This is a great way to tell them how much they mean to you, or thank them for something special they might have done for you this year. Rethink your wrapping by buying brown paper and string, or just use plain coloured paper to wrap your presents. Then you’ll avoid pricey Christmas wrapping and can use the excess during the year to wrap other gifts. If you’re Christmas shopping online, look for ways to save every cent you can. Before you start, do a web search for discount or coupon codes that you can use at the checkout. Look in the sales sections of retailers’ websites to see what’s on offer.If you know what items you are looking for, search for them online instead of just going to one retailer’s website. You might find it much cheaper somewhere else. Search online auction websites where you can ‘bid’ for items, including supplies you need for Christmas Day. Make sure you include any shipping costs when you are comparing prices. The cost of some items can blow out once you add shipping, meaning it might be better to simply go to a store to get the item. Or look for items or shopping days that have free shipping.Things are often much cheaper online than in a store, but you do need to take extra precautions when shopping online. If you follow your favourite brands and retailers on social media, you may be able to get exclusive discounts through these social channels. Their newsletters may also alert you to sales and deals. There are also discount or deal apps that you can use to find bargains that you can use as Christmas gifts. Before you buy any deal or discount, always check the terms and conditions to make sure you know what you are getting and make sure the website is legitimate. See the ACCC’s SCAM watch website for tips on how to pick an online shopping scam. DIY vouchers – We often remember the things people do for us rather than the presents they give us. Consider giving redeemable vouchers for tasks like babysitting, massages, picnics, homemade dinners or even housework. Savvy sales – Take advantage of sales throughout the year to nab some bargains and store them away for Christmas. But, even in December there are bargains to be had. You can also check out any clearance outlets near you, or sign up to their newsletters so that you’ll be in the know when they have a sale. Compare offers – Some stores match or beat competitors’ deals, so compare their offers and take all the details with you when you go into the store. Don’t be afraid to ask for a discount – you might just get a Christmas miracle! Second-hand bargains – Op shops, antique stores and second-hand bookshops can be a treasure trove for the thrifty Christmas shopper. If you’re prepared to spend the time looking through their stock, you can often find good quality items at a fraction of the price you’d pay at big name stores. Set a time limit on your shopping – Get in, get it done and get out so you aren’t tempted to spend more than you want to. Shop at odd hours – Take advantage of extended trading hours and go when it’s less crowded so you can choose carefully without having to jostle for space. Buy less expensive stuff first – If you buy larger and more costly items first you can lose perspective on what is a good price, so set your budget, buy small first, and then tackle the big stuff so you stick to your gift budget. Pre-pay – If you buy online, check if there’s an option to pick up in-store. You’ll save on freight, skip any lines, and there will be less temptation to buy more. Limit your shopping locations – Only go to shops that you need to visit so you don’t get distracted and impulse buy. Spread the Christmas cheer by giving to those who are doing it tough. Consider donating to a charity on someone else’s behalf and give this to them as a gift. As well as money, many charities also accept household items, clothes and groceries at Christmas, or you could volunteer your time to help them out. Share the catering – Even if you’re hosting Christmas Day lunch or dinner, there’s no need to shoulder all the work yourself. Ask others to bring nibbles, drinks, salads or desserts. Buy only what you need – It can be easy to overestimate how much food you’ll need at Christmas, only to end up throwing some away or eating leftovers for days. 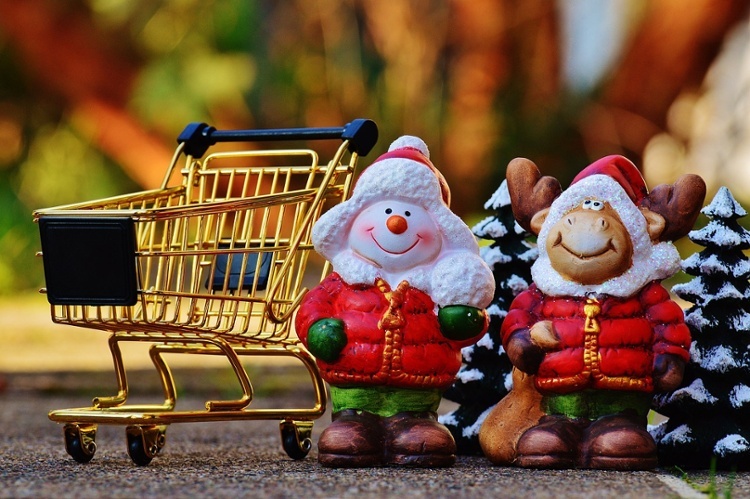 Switch supermarkets – Make a list of the groceries you need for Christmas, then take advantage of the competition between supermarkets by checking out the advertised specials and stocking up. Don’t buy everything at the same shop if you can get it cheaper elsewhere. You might even get better deals at your local butcher or fruit shop. Use loyalty credits – If you belong to a supermarket loyalty scheme that builds up credit after you’ve spent a certain amount, check if you can use the credit to get a discount on your Christmas grocery shop. Start saving now – Open a high interest savings account in January and contribute a small amount to it every payday. Saving $20 per week will add up to over $1,000 in a year’s time. Use ASIC’s MoneySmart’s savings goals calculator to see how much you’ll need to save each pay to reach your Christmas savings goal. Shop the sales – Shop for presents throughout the year, especially during sales. This will spread your costs and make them more manageable. Layby – Pre-plan larger gifts and layby them a few months ahead so you can pay them off over time. Inspiration and tips from MoneySmart, 12 money tips for Christmas. Previous Post Why Should You Be Aware of Your Credit Score?